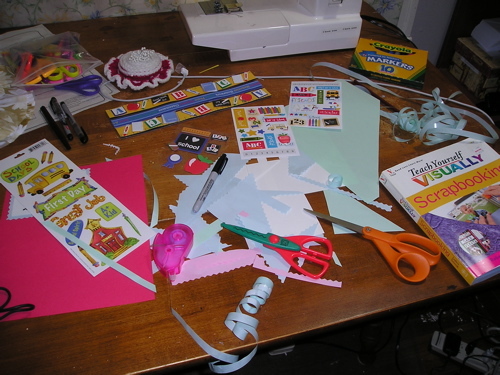 When I did scrapbooking in the past, it was using construction and printer paper. It was making do with flourescent colors and pictures printed on printer paper on a color printer. It was putting the pages in a 3-ring binder for my students to look at. Recently, I decided to do the real deal. 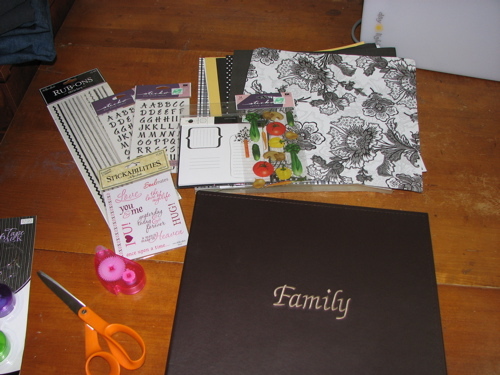 I bought a scrapbook from a discount store. 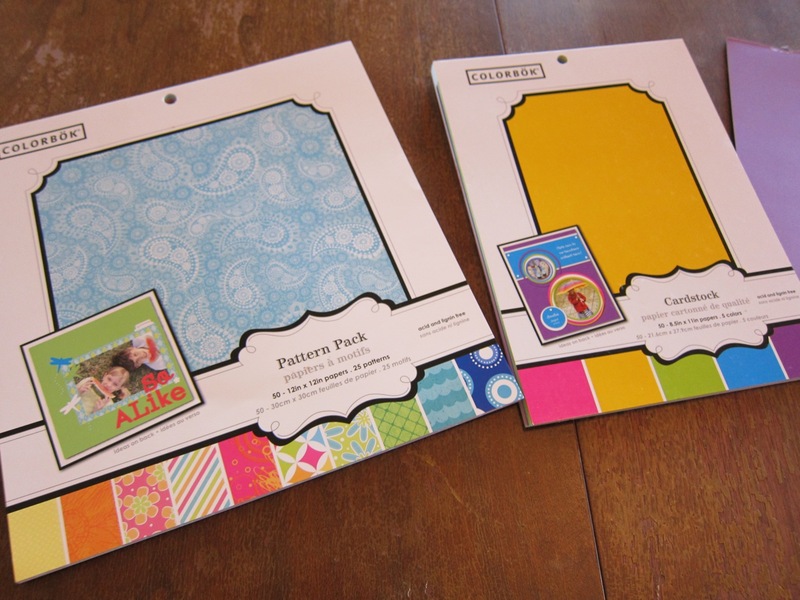 I bought a pad of scrapbook paper for a fraction of the normal price. 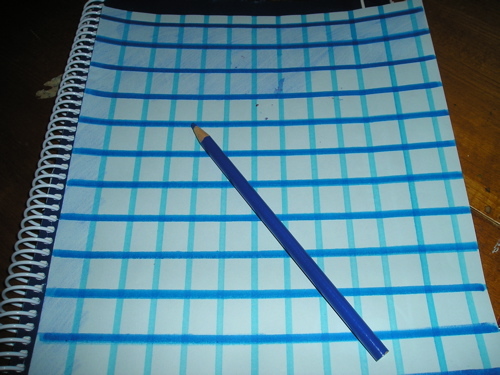 It was normally $20 and I got it for $4, just because some sheets on the pad of paper had been removed. I selected a few pictures from my iPhoto library and had them printed on a Kodak machine at the grocery store. I went to Hobby Lobby and purchased alphabet letters, stickers, double-sided tape, and a storage case for the supplies. I also purchased a paper cutter on clearance from Target, which later broke, so I had to go back and exchange it for a slightly more expensive paper cutter. You can see that the papers coordinate. That was a big help, because I have difficulty matching colors in an attractive way compared to my ultra-talented friends. One of my friends will tell you that I once tried to color a pig purple, just because that was the nearest colored pencil at hand. 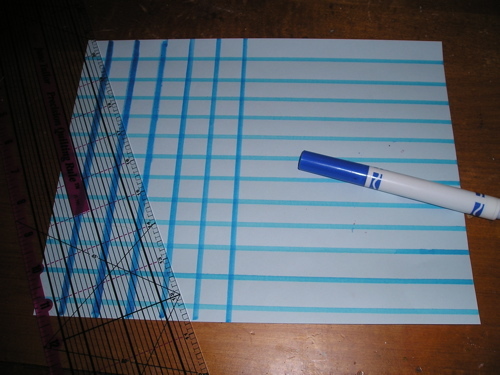 This is the original paper cutter. It worked great until the blade guard fell off and the blade started shredding the edges of paper instead of cutting it. I love the way that the papers coordinated. In the stack of paper I bought, facing pages were meant to go together. 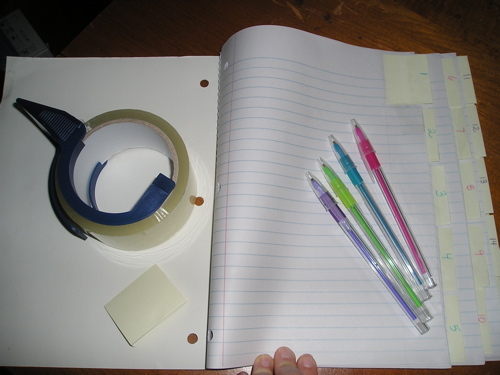 I also loved my double-sided tape! I loved these alpha letter stickers. They really made the scrapbook pages even prettier. 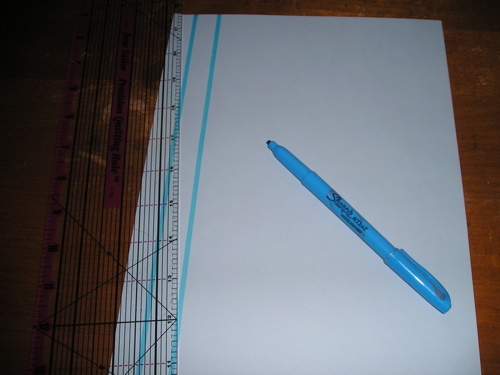 This is my new paper cutter. Notice that it has an arm on the upper left. 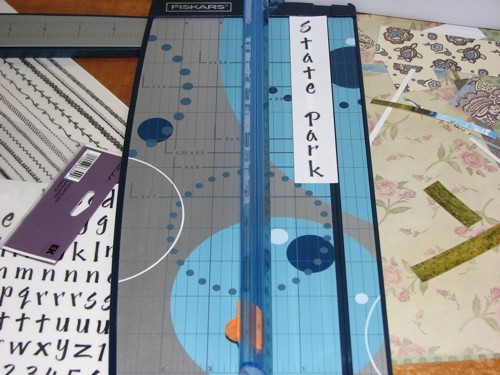 This allows you to cut full sheets of scrapbook paper. The arm folds up when not in use. The previous cutter I had was just a tad too short to cut full sheets. The pages would fit under the cutter, but the blad would not reach the edge of the page. You had to go back with scissors to finish the job. 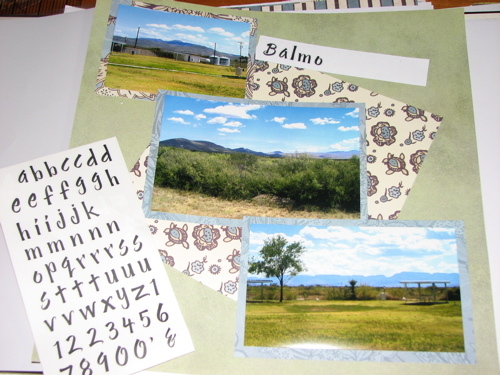 I had a great time making scrapbook pages. I was quite surprised. I was also suprised to see that most of my iPhoto pictures were of clothing and food that I made. I need to get out and do more hiking and trips so that I can take more pictures of people!! 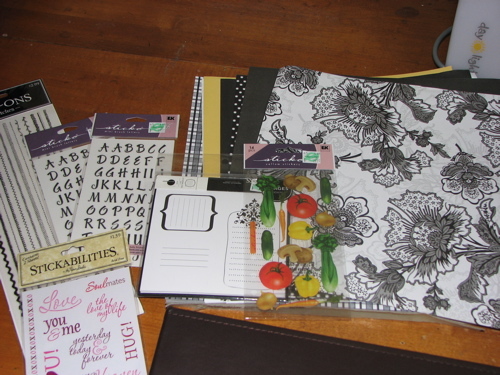 This weekend, I embarked on a journey that I don’t normally take: scrapbooking. Last year, I made a portfolio with a few scrapbooked pages. This year, I decided to get a bit fancier. 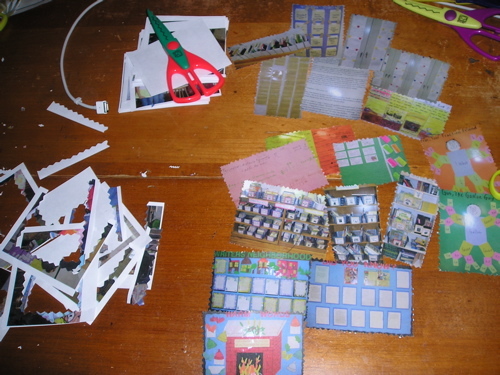 To be frugal, I only purchased double-sided tape dispensers ($4) from the dollar store, as well as some embellishment stickers from the dollar store and Wal-Mart ($5). Shopping at home, I used my own fancy scissors, personal supply of colored paper, and some sheet protectors that I already had. 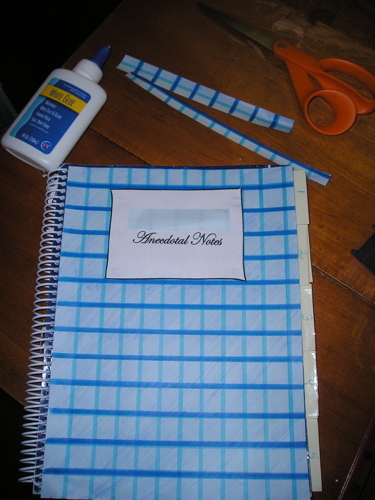 I plan to put the sheet-protected scrapbook pages in a binder (I already have one). I might also add some student work samples, but I’m not sure yet. 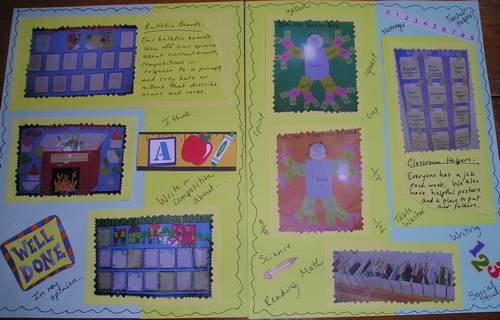 I want to add that the pictures below are only of classroom displays and student work. The majority of my portfolio pages featured my students, but I cannot show their images online for privacy reasons. I will say that their pages turned out great! You can see the mess from cutting a pretty border on each picture. 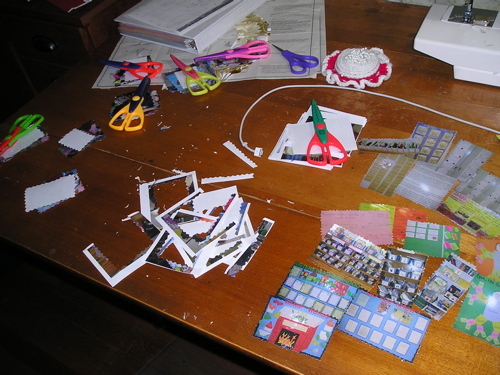 Each pair of scissors on the left side of the table is on top of a group of pictures that have the same border as that pair of scissors. 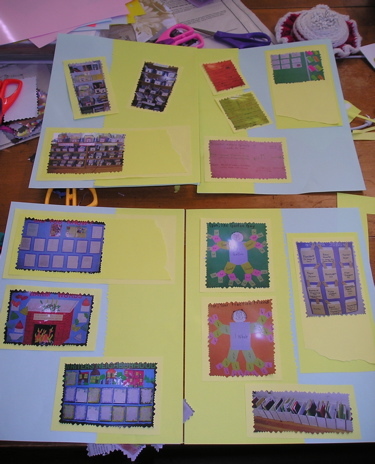 By keeping the group of photos with the scissors, I was able to make additional trimmings without searching for the same scissor design. Here’s a close up of one group of photos. 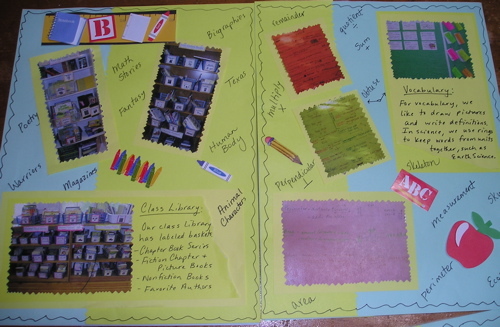 These are of bulletin boards, posters, photos of my classroom bookshelves, and photos of student work. 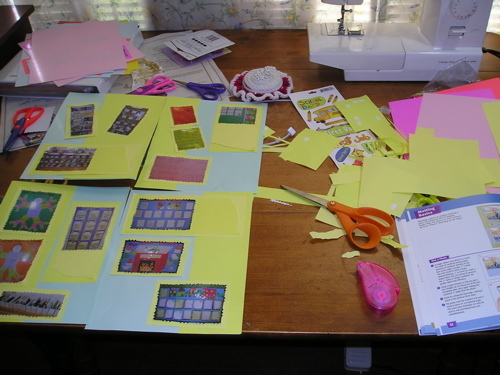 On the left are some scrapbook pages that are in progress. 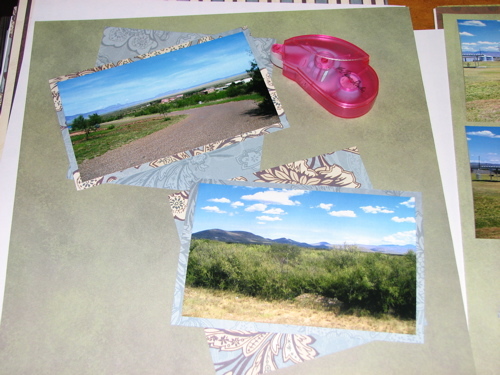 I’ve already matted the photos and made space for journaling. On the right, you can see the scrapbooking book that I picked up at Half Price Books (Teach Yourself Visually: Scrapbooking by Rebecca Ludens and Jennifer Schmidt). You can also see the mess of paper that I was using for matting and background pages. Why are my sewing machine and pins still on the table? I had enough room to work on my scrapbook, so I just left them there. 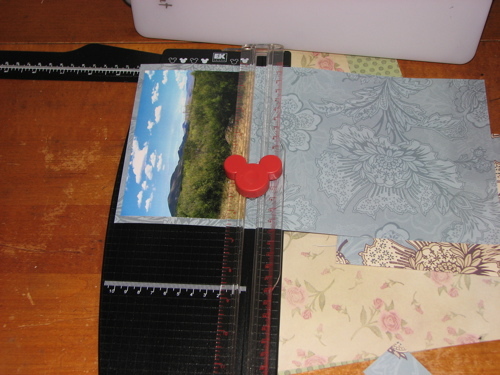 Actually, I started scrapbooking on top of a sewing project (a blouse) that was in progress. Here is a close-up of four pages. I put a yellow strip of paper vertically on the inside edges, so that there will be a continuation across pages when they are put together in a binder. This is my sometimes friend, the double-sided tape dispenser. I got 4 of them for $1 each at the dollar store. Hobby Lobby had them in a package of 3 for $8. In the picture above, you can see that the dispenser can put out one piece of tape at a time or several pieces in a row. It definitely beats using a traditional double-sided tape dispenser. 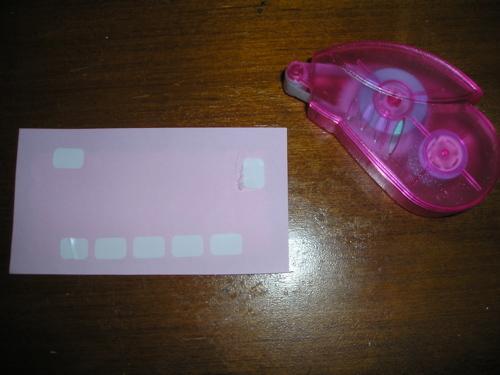 After I ran out of my pink tape dispensers (after 2 trips to the dollar store that sold the dispensers, not counting the other 2 stores that I went to, which did not sell them), I used glue for the rest of my work. What a mess! The blue curly tape is the innards of a double-sided tape dispenser. After one ran out, I went back along the tape and pulled off any pieces of tape that were left. In this photo, you can also see the variety of embellishment stickers that I purchased at the dollar store and Wal-Mart for $5. This photo and the one below are finished pages. Above left are photos of how I organize books in my classroom. I have labeled baskets (yes, I have a sticker to label the basket category on each book), such as chapter book series, favorite authors, poetry, etc. I got the ideas from Beth Newingham’s website. On the right, I have pictures of how we do vocabulary on the walls. For each word, we include a definition and a picture/example. On the left are photos of some of my hallway bulletin boards from this year. The upper-left photo is of my students’ opinions about a question related to a Time For Kids magazine article. The middle photo was from December and January, when my students wrote descriptive paragraphs (excerpts from essays) on mittens and winter hats. The bottom picture is of my students compositions. They always write their final (published) copies on fancy computer paper (from the dollar store). It makes them look extra snazzy. 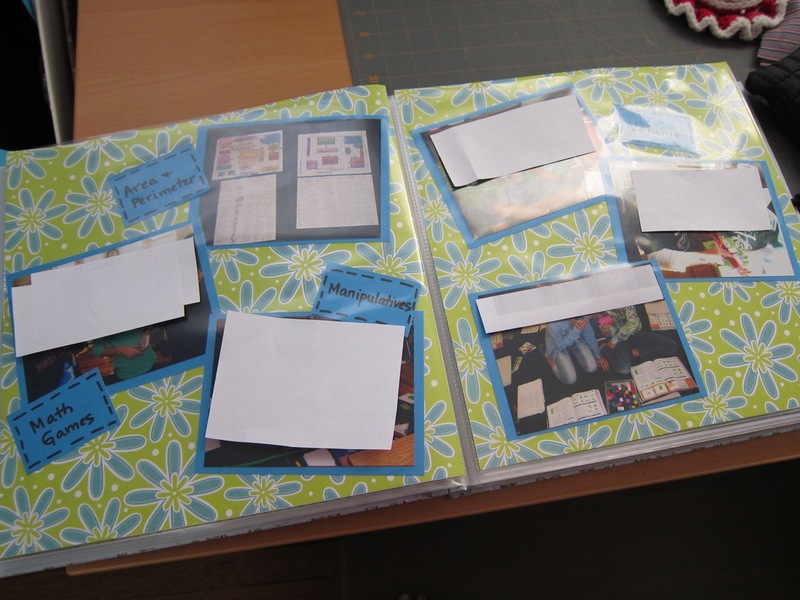 On the right-hand page, I have photos of my gallon guy and fraction friend posters, class jobs display (Each student is assigned a number for the year. Each job has a tongue depressor with a number on it. Every week, I rotate the tongue depressors to another spot on the job board. I use library book envelopes to hold the tongue depressors. At the bottom of the right-hand page is a picture of how we store our math, science, social studies, and reading folders/spirals. Each student has a box with their number on it. This way, there is some space cleared up in their desks. Plus, if I need to look at their work after school, I don’t have to dig through their desks. 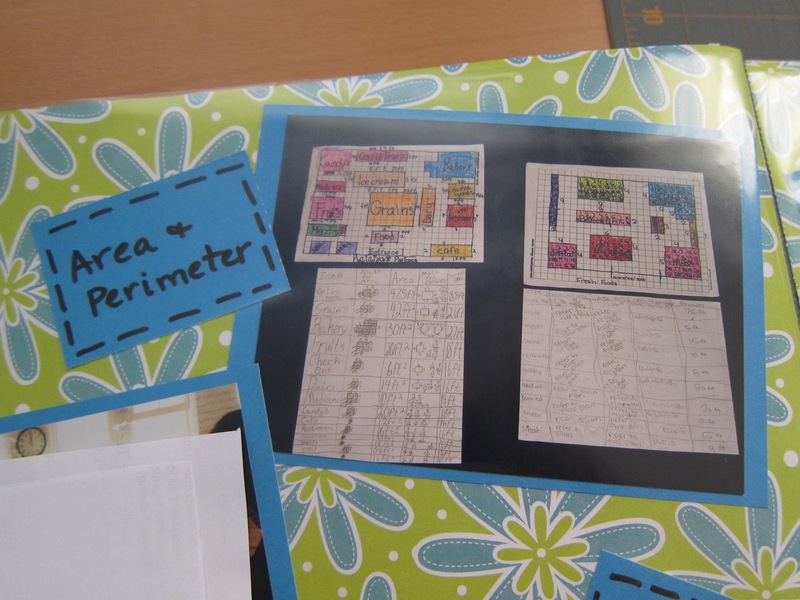 Before we had individual boxes, we tried putting all of the math folders in a box together, and so forth for the other subjects. That got too crazy when people all went at once to get their folder. 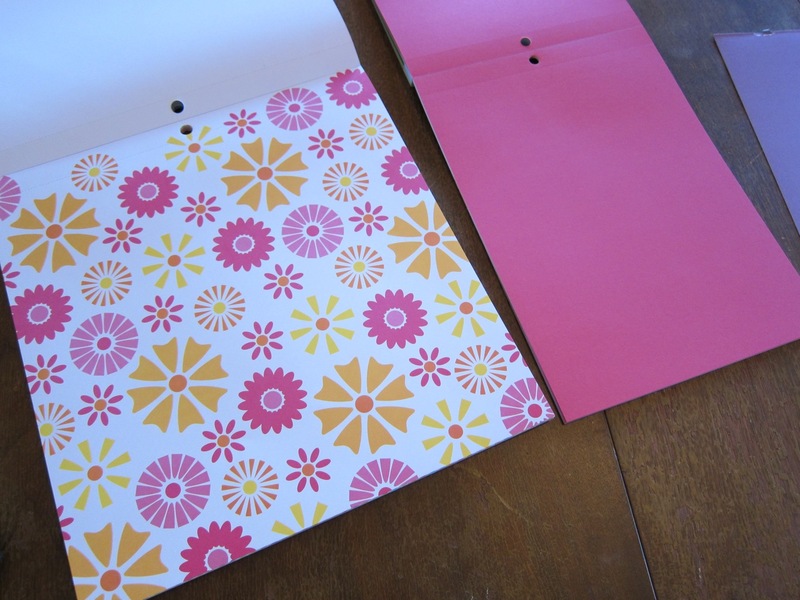 To further help organize, each subject’s folder is a specific color. Math is red, reading is blue, social studies is yellow, and science is green. Writing binders are stored in a separate box, with each student’s number written on the binding, so the binders can be stood up next to each other in order. To make the binder box at the beginning of the year, I asked an employee at a large retail store for 2 empty binder boxes. I glued the 2 boxes side by side and covered the outside with butcher paper. I keep all of the boxes (folder and binder storage) under the chalkboard rail at the front of my classroom. 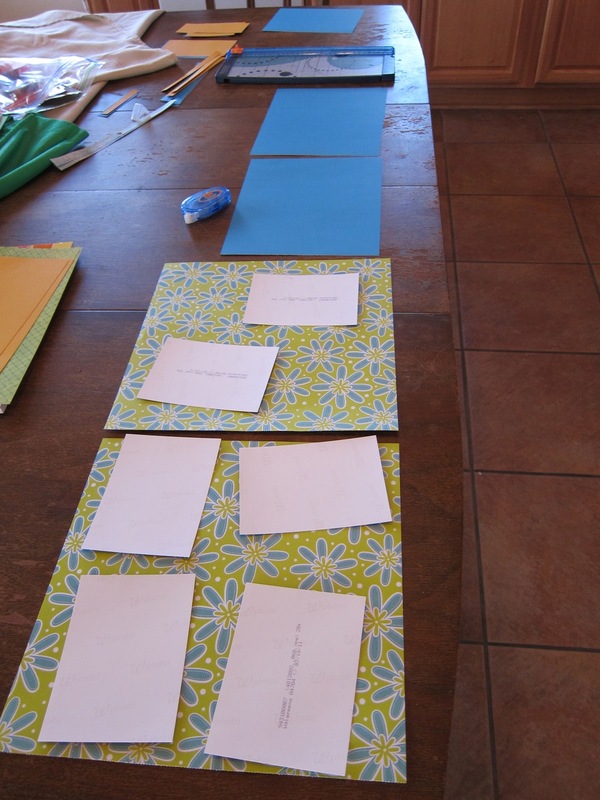 Well, that’s it for scrapbooking and classroom organization! I had a great time getting crafty all weekend. Now, I have to go purchase my groceries for the week. At least the lines at the grocery store shouldn’t be so bad, now that it’s later in the day (on a weekend).